Natasha helped launch a health initiative on Thursday wearing an Altuzarra pink suit paired with a Zadif Eg Voltaire “Girls Can Do Anything” tee. Before attending a fashion pop-up event a few hours later, she swapped her white Delvaux bag and Aquazzura pumps for a Gucci Mickey bag and white Puma sneakers. Liked her dressed up look a lot more. As for the latter, a dressed-down look works when it feels effortless. Hers didn’t. Style spotlight is a feature that sheds light on South Indian celebrities that have been pushing the style envelope. 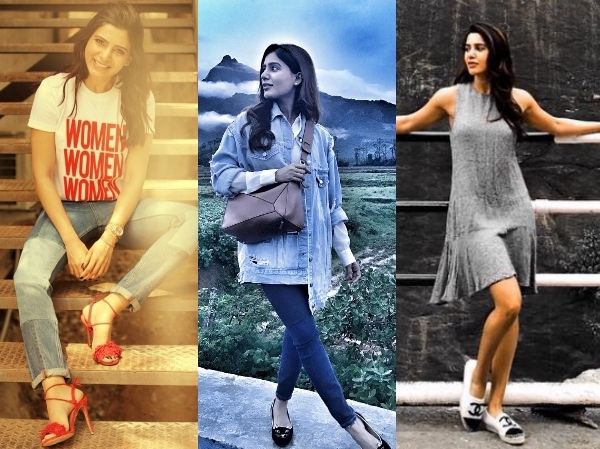 This week, we are talking about Samantha Akkineni’s personal style. While she is known for churning out some winning fashion looks, it’s her un-styled, personal collection of shoes on her instagram profile, that caught our eye. From whimsical flats (Charlotte Olympia), to comfy espadrilles(Chanel) and fun shoes (Aquazzura), she has them all. Here’s a glimpse at her shoes. Must say that we are quite in awe of her collection. 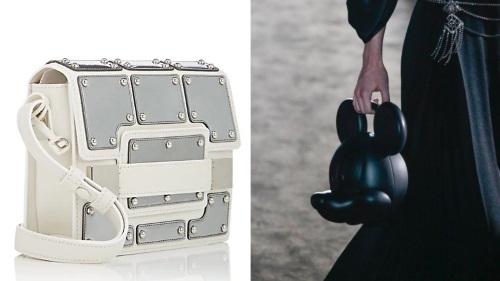 Are you more of a bag person or is it all about the shoes for you too? Do you have a pair of shoes that are you are currently obsessing about? Promotions for Sui Dhaga this week in Jaipur saw Anushka wearing brown head to toe in a Koashee top paired with Zara pants and her Aquazzura sandals. Sonam attended the HT Most Stylish Awards wearing a dress by Paris based label, Hyun Mi Nielsen. By now, we’ve come to expect Ms. Kapoor to always deliver something OTT especially when it comes to such high-profile events and she definitely did that. But, except for the color and the Aquazzura sandals, I really didn’t like the dress. Oddly, it wasn’t that sleeve that did it for me. The deal breaker for me were those darts creating a conical bust. An homage to 90s it may have been but that doesn’t mean I have to like it. Also, I didn’t think the diamond jewellery worked with the color. Maybe something in gold would’ve worked better. Did you like this appearance of hers?